Belgium, Netherlands, Christine de Pizan, New friends, and Art, art, art! And the Internet, did I mention the Internet? Wow, what a summer I have had! So many new experiences, so many new friends from all over the world, and world class museums! Where do I start? In small bites I think. Conference hosts Olivier and Tanya show off a thank you gift from conference participants: Framed images of my collages from The Dinner in the City series! To begin, about two years ago, a medieval scholar from Chicago, Julia Nephew, discovered my artwork on the internet. She was writing an article on the 15th century writer Christine de Pizan for an academic journal. I just happened to have used Christine in a series of collages I created between 2003 and 2007. Julia asked permission to use some of my images in her article. We negotiated a contract and some months later a book arrived from Florence, Italy containing Julia’s article and my images. Because of this I was invited to speak at the North American Conference of Medieval Scholars at Western Michigan University. 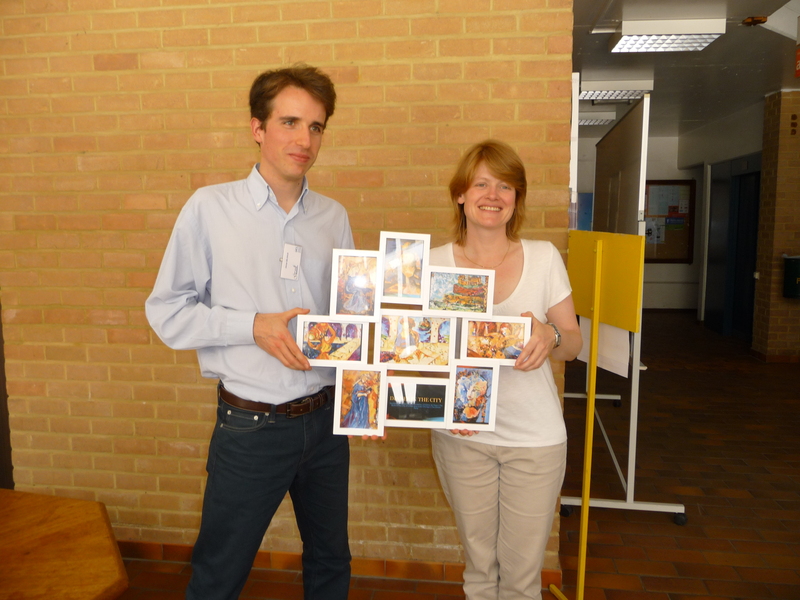 Because of that, Julia and I were invited to co-present at the International Colloquium Christine de Pizan in Belgium! So, off I go to Belgium, by way of the Netherlands. 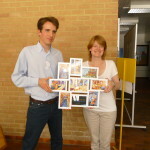 I will expand on that in a future post, but this time I want to give a shout out to the organizers of the conference, Oliver and Tanya of the Catholic University Louvain la Neuve in Belgium. They were the ultimate hosts! This entry was posted in Dinner in the City, Pip's BLOG and tagged art, art history, Belgium, collage, International Colloquium de Christine de Pizan, Louvain la Neuve, mixed media, women's history on July 31, 2015 by Marsha. I have been in the studio a lot this week, working on several new pieces. For some reason I have gotten hooked on Medusa, the mythical woman with snake hair. She was not always a negative figure; early in her incarnation she was a figure of power and strength. She exists in many cultures and her history is an interesting one. Anyway, I am working on my third Medusa collage, as well as a series of pieces for Clothes That Work, an area non-profit that helps job seekers with appropriate career clothing. Because I am not deft with a camera, new photos of art can be slow to appear, so I apologize for that – I am working on the do it myself photography thing! I recently took a workshop presented by Dayton photographers extraordinaire Andy Snow and Kevin Messer, and bless their hearts they helped alleviate the “fear” I have of shooting my own work. I think I just might be able to do it! Anyhow, please stay tuned. New photos will crop up one of these days. This entry was posted in Pip's BLOG and tagged art, collage, Medusa, mythology, studio, time, women's history on February 6, 2009 by Marsha.